Edition of 3002 of which 125 copies are signed 1-125, 26 copies are signed A-Z as artist's proofs. Twenty-six are signed as dedication copies. Progressives: One set to Trisha Urmi Banerjee; one set to Peet's Coffee & Tea; one set to Saint Hieronymus Press. In the America before Alfred H. Peet, coffee was (and in most of this nation, remains), a hot, thin, bitter stimulant, best taken with cream & sugar. My grandfather ushered in the day with a percolated pot of Folger’s, cut in almost equal part with “armored cow”--his term for Carnation canned, sweetened, condensed milk. It smelled really good, with overtones of Prince Albert tobacco, leather and wood smoke rounding out the olfactory feast. But it didn’t have much of a taste. Plenty of caffeine, yes. A few cups of Folger’s wound your spring for the whole day, and as it aged in the pot, gradually burning, it got stronger but not better. In 1966, Mr. Peet, late of the Netherlands, brought coffee flavor to coffee aroma, and the seed of California Cuisine was planted at Walnut and Vine. 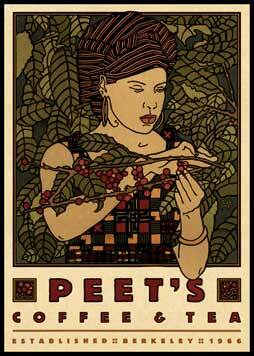 A cup of Peet’s coffee has the full velvety thickness, the mouthfeel, that the fragrance promises. Peet’s coffee is coffee that tastes like coffee smells. I’m not sure that my grandfather would have liked it, but I do.